Did you know that the Monkey King has a connection to Cinderella? The earliest known version of her story is based on Rhodopis, a tale set in ancient Egypt. It describes how the god Horus sends an eagle (or takes the form of one) to steal the slipper of the titular Greek slave and deliver it to an Egyptian Pharaoh, who launches a search for and eventually marries the woman. The tale was first recorded by the Greek geographer Strabo in 7 BCE (Ripley, 2010, pp. 185-188). However, the work is part of a wider story cycle evident throughout Asia and the Middle East. The earliest version that appears to have many of the familiar elements from the final European version hails from China. Titled “Yexian” (葉限), the story describes the titular heroine working as an imprisoned servant for her evil stepmother, the bestowal of a beautiful dress and slippers by a female ancestor from heaven, her attendance of a local festival, the loss of one of her slippers while fleeing the festivities, the discovery of the shoe by a foreign king, and a search that results in their eventual marriage. The story is based on the oral tales of the Zhuang ethnic people (of the Vietnamese-Chinese border) and was first recorded by Duan Chengshi (段成式) in the 9th-century CE (Ripley, 2010, pp. 191-192; Beauchamp, n.d.). Certain elements of the story appear to have been influenced by the great Hindu epic the Ramayana, written by Valmiki around 500 BCE. The story tells how Sita, the wife of Vishnu’s reincarnation Prince Rama, is kidnapped and held prisoner by the demon Ravana (with the intent of making her his wife) on the island of Lanka. 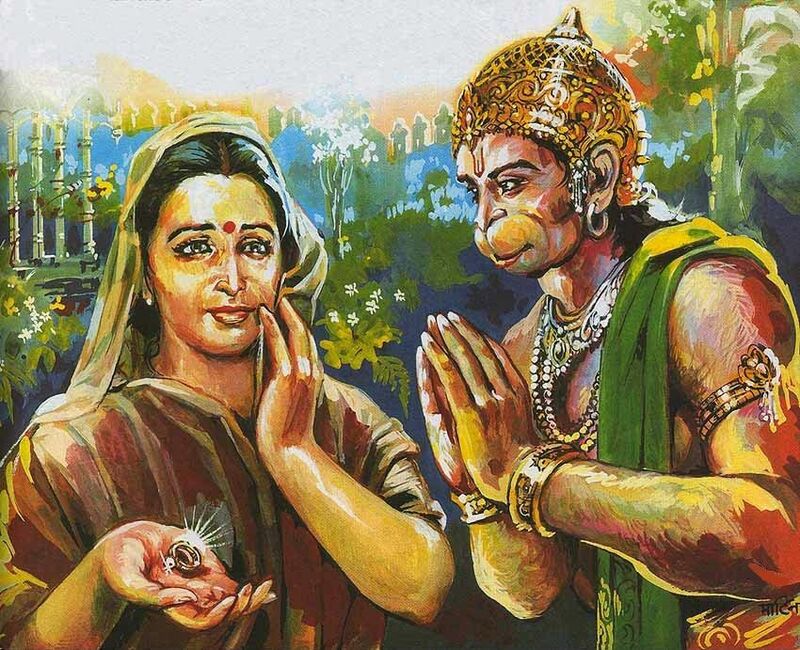 It is during her time in captivity that she is visited by Rama’s servant, Hanuman, a monkey demi-god, who brings her the prince’s ring to prove himself a trustworthy ally. 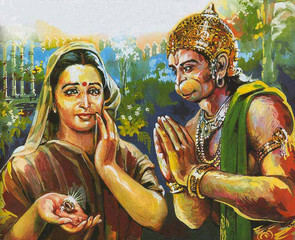 The simian character then brings her anklet to Rama to prove she is still alive. Rama’s army assaults Ranava’s fortress, and he is eventually reunited with his wife. This at first may not seem like it matches at all, but you have an imprisoned beauty (Sita vs Yexian), supernatural assistance from heaven (Hanuman vs. the female ancestor), the exchange of personal items to prove one’s identity (the ring and anklet vs the slipper), and a campaign that brings together the woman and a man of royal blood (Sita and Rama vs Yexian and the foreign king) (Beauchamp, n.d.). Scholars believe that secularized snippets of the Rama story cycle came to China in several waves, one of which was via Southeast Asian Hindu converts who settled in Southern China from the 7th-century onwards (Walker, 1998). As some of you may know, many scholars believe Monkey was influenced by Hanuman, and this fact is best illustrated in chapters 68 to 71. The episode sees a queen being kidnapped and held prisoner by a demon (with the intent of making her his wife) in a faraway land. Sun Wukong is employed to find her. He brings back a bracelet to her husband as proof of life and identity, and eventually reunites the couple after defeating the demon (Beauchamp, n.d.). 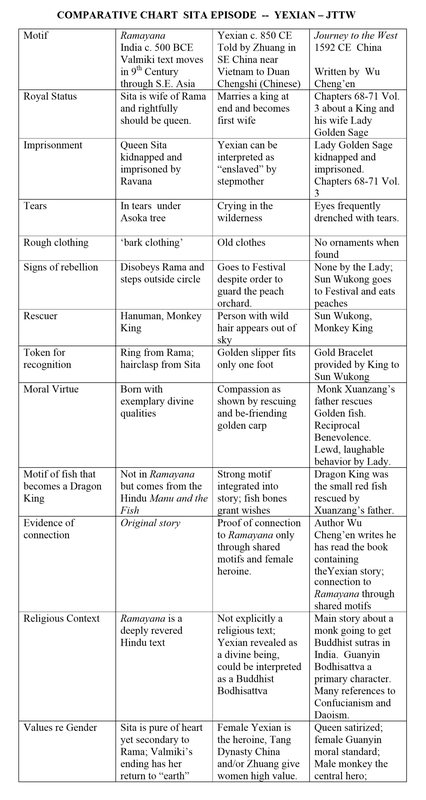 Beauchamp (n.d.) provides a diagram showing the similarities between the stories of Yexian, Sita, and the queen from Journey to the West. Ripley, D. (2010). The maiden with a thousand slippers: Animal helpers and the hero(ine)’s journey In Patricia Monaghan (Ed.). Goddesses in world culture (pp. 185-200). Santa Barbara, California: Praeger.